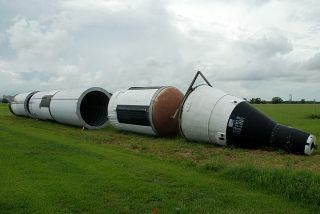 A Gemini-Titan display lies on its side, awaiting its repair and restoration at Johnson Space Center in Houston. Scientists have discovered the first evidence of graphite on themoon — the same carbon-rich stuff used in pencils today — after taking a newlook at a lunar rock collected by astronauts nearly 40 years ago. This graphite appears to have originated in a lunar meteoritestrike around 3.8 billion years ago, researchers said. It could shed light oncosmic impacts that rocked themoon and our planet just when life was starting on Earth. Scientists found roughly 70 tiny graphite needles, whichscientists called "whiskers," on a lunar rock from Mare Serenitatis,"the Sea of Serenity," brought back in 1972 by Apollo 17, the last ofthe manned lunar landings. They were originally looking for another mineral,phosphate-rich apatite, as part of research into wateron the moon. "We came across the graphite by total accident," saidresearcher Andrew Steele, an astrobiologist at the Carnegie Institution ofWashington in Washington, D.C. Although past studies of lunar rock have identified carbon-loadedminerals before, this is the first time pure-carbon minerals such as graphite wasdiscovered. Previous studies suggested the carbon came from deposits left bysolar wind. The moon graphite formed in a period scientists dub the LateHeavy Bombardment. During this time, the moon, the Earth and most of the other bodiesin the inner solar system apparently underwent massive cosmic impacts. Sincecraters from this cataclysmic time have eroded on Earth, this graphite on themoon could shed vital clues to this mysterious era. In addition, the fact this form of carbon survived on the moonsuggests the lunar surface could still possess remnants of carbon-rich organicmolecules from ancient cosmic impacts — the same kind of compounds delivered tothe early Earth about when life was emerging on our planet. "Webelieve that the carbon we detected either came from the object that made theimpact basin, or it condensed from the carbon-rich gas that was released duringimpact," said study co-author Francis McCubbin. "The most excitingprospect from the discovery is that we now know that the moon holds a record ofthat period and the materials that contributed to the rise of life on Earth." Although organic molecules such as amino acids have been seen onlunar samples before, "most of these measurements were put down tocontamination at the time," Steele said. "Perhaps a reappraisal of the Apollo samples would yield significantdata on the organic inventory that was delivered to earth by meteorites at thetime life was potentially starting on Earth," he added. Theresearch is detailed in the July 2 edition of the journal Science.